The Living Room is probably my favourite part of the house. It has undergone such a transformation since I moved in and I truly believe that a stylish living room goes a long way. It can be something that people really remember a house for as it’s likely that when you have guests over you’ll all be spending most of the time in the living room. In my case, it’s also where I like to relax after a long day working. The layout was horrible, with a table and chair tucked away behind the sofa. The sofa was also rather disgusting and covered with stains, so one of the first things we (me and my parents) did was dismantle it and scrap it. The carpet was also a terrible quality (and stank of cats’ wee in some places, yuck) so that was all ripped up as well. We chose a grey carpet throughout the house and the new sofa and armchair came from DFS. Living room decor after initial redecorating work. Armchair and footstool – DFS, red cushion – The Range, table and barstool – Amazon. Two years later when the inspiration hit me to truly put my own stamp on my first home (which came from my discovery of Instagram) I set about a transformation from ideas that came about from people I followed, plus ideas that came from my own imagination and also browsing on Pinterest. I decided that I really liked monochrome styles and magnolia just didn’t work as well as white. You wouldn’t think going from magnolia to white would make such a big difference, but it definitely does. It works so much better with the style and the room feels a lot brighter and fresher. Some people have said to me before how white can look very clinical and cold, but I think when used in the right way it doesn’t have to be the case. Thankfully my living room didn’t stay in this state for long. I had to do an assault course to sit down on the sofa! The paint I used was the “Absolute White” Colours Premium range from B&Q. 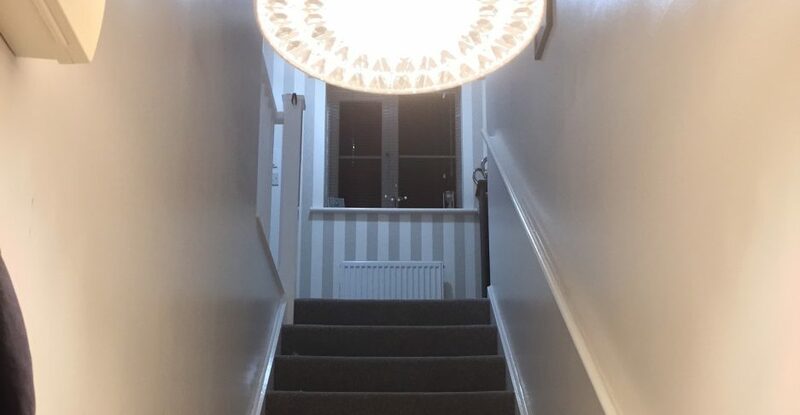 I painted the skirting boards grey, which is the “Light Rain” eggshell paint from the same place. It took a while to get to the next part as I wanted wallpaper for the wall where the TV is, but that’s not something I can do on my own and because money has always been an issue I didn’t want to get someone in. I was relying on my dad, who is in the building trade, to help with the rest of the transformation. The wallpaper you can see being put up in the photos below came from B&Q. It is much lighter than the dark grey paint that was there before and instantly makes the room feel tons brighter! We stopped the wallpaper at the dividing line between the living room and kitchen areas. The towers of drawers you can see either side of the TV were from a local shop and were originally hessian but I painted them myself. I wanted to make them look like the opposite of the pattern on the boxes below the TV, so white on black instead of black on white. Hessian isn’t the easiest thing to paint but I am pleased with how they turned out. I also decided that the wall where the sofa is needed something either side of the canvas print. I bought a couple of wicker hearts from Dunelm and painted them with the same paint that I did the skirting boards with. They are light enough to hang up with drawing pins so that job was super easy. The canvas print depicts the Eiffel Tower and people walking along the river with umbrellas – it is a black and white photo, but the umbrella in the centre of the photo is red. I decided to mimic that with the sofa by adding a red cushion in the middle, which I picked up from The Range. The silver cushion and the black cushion with “Love” printed on it are from Next, my favourite shop. I am a regular in my local Next store, which also sells homeware and has a Costa coffee shop in it too, so I often have lunch in there on Sundays while I am out shopping if I am not doing anything else. The “Keep Calm and Carry On” sign was replaced with a custom A3 print from Lauren Loves Prints on Instagram (@laurenlovesprints), who I highly recommend. This one is a word collage made up of friends’ names and memorable dates and places, so my happy memories are never far away when I am lounging in my home. A shot showing the living room sofa and the kitchen table and bar stools in their new position. Zigzag stool – The Range; red cushion, tea lights on kitchen table, wicker hearts, curtains – Dunelm; A3 Print – Lauren Loves Prints; sofa – DFS; lighting – Philips Hue. The Paris canvas print up close, which provided inspiration for the cushions on the sofa. The last step was to build a “TV Wall” feature in here to provide a focal point for the living room in the absence of a fireplace, the inspiration from which came from Instagram and Pinterest. Prior to the wallpaper going up I tried to experiment with masking tape to determine the best size. The radiator was a problem but me and my dad got around that by shifting the TV over slightly, taking the box shelves down and putting them back up in a vertical line. Experimenting with different sizes for the TV wall. The TV wall feature consists of a 6mm piece of MDF fixed to the wall with wooden batons, allowing the board to stand proud of the wall by a couple of inches. This was really easy to acquire and it made for a really quick and cheap way to transform the look of the wall. A note about the TV – it is a 43″ Philips Ambilight, which has a really cool feature with lights on the side that shine on the wall it is in front of. These lights follow the picture, each one taking on the colour of whatever is on the part of the screen nearest to it. It makes the viewing experience really immersive and makes excellent movie nights in. I can’t wait to get a 5.0 Sonos sound system in here to complete the home cinema (not 5.1 – I’m pretty sure a subwoofer wouldn’t go down well with the neighbours). After taking advice from a couple of my Instagram followers, I decided to replace the unit in front with a lower one from Argos that I picked up for about £35. It was really easy to assemble and did it myself in no time at all. This allowed the entire TV wall feature to be visible and the items placed on top perfectly hide the wires underneath without the need for conduits. We then just had to put the shelves back up in the corner (easier said than done with shelves of this type) and then we were pretty much done. The finished TV wall and shelves. TV unit – Argos. I wanted something to go in front of the radiator as I felt as if that space needed something (my Christmas tree was there last year) and wondered about putting a beanbag there. I decided to save my money and move the footstool in front of it instead. Draped over it, in the photos above and below, you can see a chunky knitted blanket from Chun-kees (@chun_kees on Instagram). They make chunky blankets, bed runners and cushions, all made to order. I was fortunate enough to get this one in a flash sale and love it, and will be getting others for my home as funds allow. It is very cosy to get under on a cold winter night and they make attractive additions to a home all year round. I highly recommend them! Another photo of the living room, this time more clearly showing the TV and chunky blanket from Chun-kees. That pretty much wraps up the living room! There is more that I could do here like various finishing touches and also a round coffee table in the centre like I’ve seen in some living rooms on Instagram, but for the sake of this project I am considering it done for now. All six of the lights in this room can be set to any colour and brightness using the Philips Hue app. At the time of writing, this particular project isn’t quite finished as there is one more in the kitchen that needs to be installed but when that is done I will write about the lights in each room of the house in detail. See below for a “then and now” pair of photos. All this was styled by me and I am so happy with how far my home has come.